Jonathan Murray and Shelley Brown aren't the kind of children you remember. They're not particularly good at anything. Mind you, they're also not particularly bad at anything. They're just absolutely average. Teachers can't remember their names. Their own neighbours don't even recognise them. Average intelligence. Average looks. Unremarkable. Forgettable. Truly unexceptional children. Which makes them the perfect spies! When an incompetent guard enables a criminal mastermind to break into the White House and steal codes that threaten national security, only the President's secret spy force can be trusted — the other, better known agencies (FBI, CIA) might already be compromised. 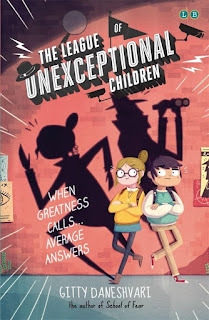 So, it's time for the League of Unexceptional Children to spring into action, with its two newest recruits, Jonathan and Shelley, sent in to uncover the identity of the Seal, find the missing US Vice President, and stop all of America's secrets being sold to the highest bidder. This book is an absolutely fantastic read. The writing is sharp with a wonderfully understated line in humour. As utterly average Jonathan comments, 'When people say that "the children are the future", they aren't talking about me.' Shelley's over-inflated sense of her own abilities is nicely balanced by Jonathan's complete self-doubt, as they bumble along, somehow succeeding in spite of themselves. Quotes from other 'unexceptional children' at the start of each chapter are a great touch, and include such gems as 'I've been eating three bowls of blueberries, aka brain food, a day for the last six months and I still don't understand algebra.' Of course, they, together with the story itself, only go to prove that there is no such thing as an 'average' child and that we are all exceptional in our own way. But this isn't a book for dwelling on deep and meaningful messages. It's a fun, page-turning read for kids that should happily occupy them for a few hours these holidays. Further good news is that it looks like Jonathan and Shelley will be back for another mission too!